Pilsen resident Dolores Mederos was one of the first people in Chicago to complete a new program to help people improve their credit score and save money at the same time. Her score went from zero to 699 within six months. Photo by Jason Reblando. Dolores Mederos likes numbers. A former accountant in Mexico, she keeps a detailed monthly budget for her household in a computer database. But one thing about the U.S. financial system puzzled her: credit. Credit scores can go as high as 850, but a good score is considered anything above 680. With a low score, an individual is likely to pay higher interest rates on a car loan, higher mortgage rates, and need to put down security deposits on cellphones, apartments and utilities. But in the mortgage-lending world, a score of 620 is what most people need to get approved for a mortgage on a home. Even though Mederos was a great financial manager, her credit score was zero. It would have been very difficult for her and her husband to fulfill their dream of buying a house. Then, a year ago, she heard about the new Twin Accounts program from her financial coach at the Center for Working Families’ Pilsen office. Under the program, Mederos could save money, earn it and build her credit score in a relatively short period of time. The program helps people with no credit or blemished credit histories. To begin building credit, clients take out a loan at Northside Community Federal Credit Union, most often in the amount of $500. The clients never see that money until the program ends; it goes into a locked account at the bank. Each month, the client makes a payment toward the loan, building their credit. If the person makes the payment on time, the center matches the payment dollar-for-dollar. By the end of the yearlong loan, a client has the potential to have $1,000 saved and a good credit score. The program is open to clients of the Centers for Working Families, which have 12 sites located throughout Chicago. The year-old program is the first of its kind in the nation, pairing the old adage of putting away money for a rainy day with the financial reality of a good credit score. It’s too early to determine the program’s success. But since it began in 2010, 22 people have enrolled, and six have successfully completed the program. Only one person has had to drop out because of a job loss. The rest are still in the process of completing the loan. The average credit score among all the participants who have finished the program is 658, including clients who had no credit or bad credit. Mederos was optimistic about the program, and within six months her credit score went from zero to 699. Having no credit can mean thousands in additional expenses for individuals. Consider the interest rate on a five-year car loan for $10,000, Lowitz said. With a low credit score, a person could expect an interest rate of up to 25 percent, meaning they would end up paying $7,611 in interest over five years. But a person with an excellent credit score could get a 5 percent interest rate, paying $1,323 over the same period of time. That’s a potential savings of more than $6,000, a lot for a family on a tight budget, Lowitz added. Many low-income families have no credit, Lowitz said, because they don’t use credit cards. Many people are under the impression that paying their bills on time—rent, utilities, phone—builds credit, but it doesn’t always work that way. Companies vary in terms of whether they report this information, and some companies only report when an account has been sent to collections. Lowitz said having active, well-managed credit cards is the only reliable way to build credit. Linton Johnson is another client who is using credit to get ahead—not for himself, but for his family. Johnson said he didn’t have bad credit—just no credit. He’d most often paid his bills in cash and never needed credit. But these days, good credit could help one of his family members get a loan on a house, a car or a college education. Johnson’s credit score increased from zero to 680 within a year—and it’s still climbing. After the program ended, Johnson was able to get a credit card, which will allow him to continue to improve his score. Living in North Lawndale most of his life, he said he sees a lot of people dealing with credit card debt, and the community needs more programs like Twin Accounts to teach them how to use credit wisely. 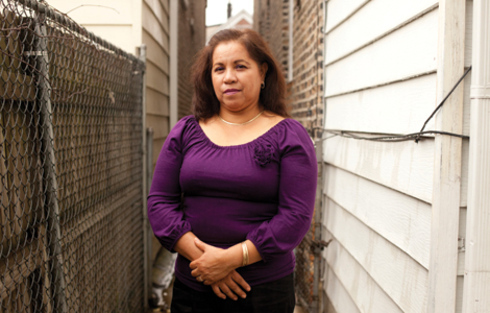 Many low-income families across Chicago struggle with poor credit scores and a lack of assets. Minority communities in particular struggle with bad credit, according to a report released last year by the Woodstock Institute, a Chicago nonprofit that researches lending, wealth and financial systems reform. People living in black communities were almost four times as likely to have low credit scores as people living in predominantly white communities. The opposite was true for high credit scores, with people in white communities more than three times as likely to have individuals with high credit scores than people living in black communities. “The concentration of individuals with low credit scores in communities of color means they likely face more limited access to economic opportunity than people living in white communities,” said Geoff Smith, Woodstock’s former vice president, who is now the director of DePaul University’s Institute for Housing Studies. Pauline Sylvain sees this all the time. She works as a financial counselor for the Centers for Working Families in North Lawndale. Sylvain said she introduces the idea of the Twin Accounts program to her clients when they’ve already made some financial progress—a balanced budget with a little room for an additional monthly payment. “We talk about some of the things that they’ve tried to get and couldn’t get because of their credit,” she said. But good credit doesn’t guarantee a perfect financial future. Mederos’ husband lost his job soon after she enrolled in the program, pushing off some of their financial goals.